The F.D. 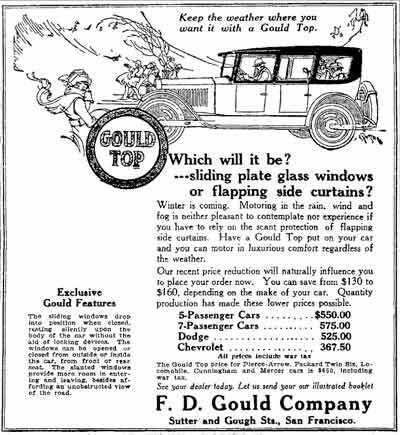 Gould Co. was a San Francisco-based manufacturer and installer of aftermarket all-weather tops for roadsters and touring cars. Its proprietor, Frank D. Gould is credited with introducing the "California Top" to northern California and he held 5 patents related to their design and construction. 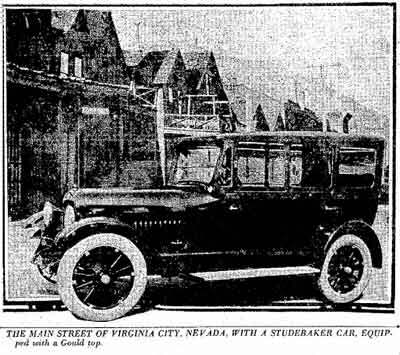 "F. D. Gould has leased the entire top floor, containing 10,000 square feet, of the building at Golden Gate Ave. and Polk St., for an automobile painting shop." There's added economy in buying the Gould Top now —prices are reduced. Besides the extraordinary value the Gould Top possesses, there is a decided having in dollars and cents. The Gould Top is in a class by itself. The growing preference shown for it by discriminating people is a fitting tribute to its beauty and dependable service. Ask your motor car dealer to point out the exclusive, Gould features. He will show you how the sliding glass windows DROP into position when closed and rest silently and securely upon the body of the car without the aid 'of looking devices. You will also see the advantage of the stylish slanted windows which afford more shoulder room in entering and leaving, besides giving the driver an unobstructed view of the road. Have you a copy of our illustrated book that tells about the Gould Top. We will gladly send one to you. F. D. Gould Company, Southwest Corner Sutter and Gough, San Francisco, Calif.
"Keep the Weather Where You Want I with a Gould Top"
Which Will It Be—sliding plate glass windows or flapping side curtains? Winter is coming. . Motoring in the rain, wind and fog is neither pleasant to contemplate nor experience if you have to rely on the scant protection of flapping side curtains. Have a Gould Top put on your car and you can motor in luxurious comfort regardless of the weather. Our recent price reduction will naturally influence you to place your order now. You can save from $130 to $160 depending on the make of your car. Quantity production has made these lower prices possible. 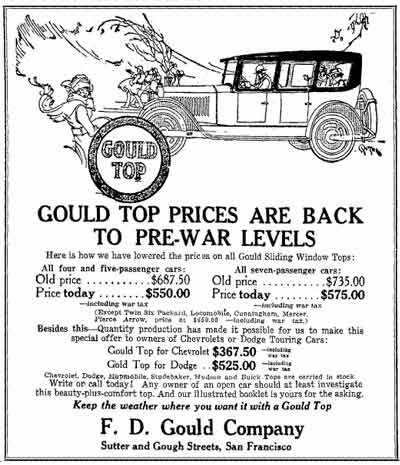 The Gould Top price for Pierce-Arrow, Packard Twin Six, Locomobile, Cunningham and Mercer cars is $650, including war tax. 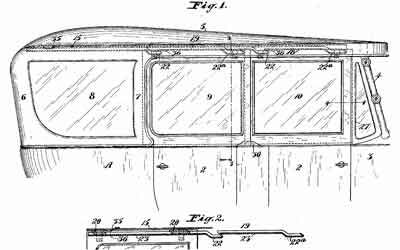 The sliding windows drop into position when closed, resting silently upon the body of the car without the aid of locking devices. The windows can be opened or closed from outside or inside the car, from front or rear seat. The slanted windows provide more room in entering and leaving, besides affording an unobstructed view of the road. F. D. Gould Company, Sutter and Gough Sts., San Francisco." As the preceding ads convey, by now Gould had relocated to 1507 Sutter St. (S.W. corner of Gough St.) which was located a half mile northwest of their Polk St. shop. The structure still exists although it's been substantially modified in recent times. 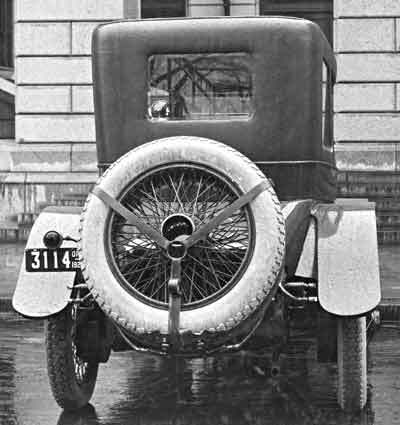 "The California Top represents the present-day culmination of a concerted effort on the part of body engineers in this country, to produce a really satisfactory type of convertible enclosure. 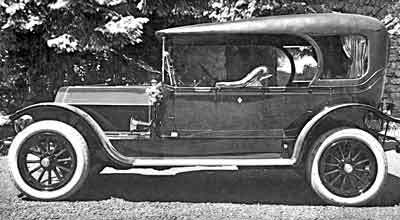 This particular style took its name front the Pacific coast state since the development of a readily convertible open car was particularly demanded in California because of weather conditions peculiar to that region. Days are generally very warm there and demand the protection of an open top with ventilation unhampered by windows. The evenings, on the other hand, are accompanied by heavy dews and a relatively large drop in temperature which makes one uncomfortable in an open car. The car owners seldom wished to lower their tops, disliked the saggy appearance of the folding style and demanded something more pleasing to the eye. The body builders and designers recognized this demand for a more durable and satisfactory type of curtain and top than the customary folding type with celluloid lights and began the development of what has come to be known as the "California top." "The first step, taken six or seven years ago, was to construct a solid frame top of wood, covering it with artificial leather and using glass lights in the sides and rear instead of the customary celluloid lights. This top did not perhaps, represent any great improvement over the "one-man" top. It was more rigid, but the flapping, bothersome storm-curtains were retained and were loosely attached by means of fasteners or buttons. Nevertheless, these tops sold well. They were something different and since most of them were custom built, each particular owner had an opportunity to express his own fastidious tastes in form and color. The natural result of this self-expression was a conglomeration of designs and clashing color contrasts. The bevel-edge plate glass windows in the back and rear quarter curtains were fantastic in shape and represented anything from a half-moon to a diamond or oval. "The curtains carried moisture into the top when rolled up after a rain storm, causing the headlining to become moldy, with consequent deterioration. The celluloid lights were dried out due to the heat of the sun on the top, crystallized and become brittle, and were fogged so that vision through them was impossible. Although this type proved to be popular for a time, body engineers soon recognized it as a mere stepping-stone to the construction of something possessing the same utility but of greater durability. 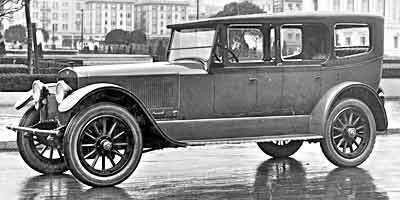 "A body builder by the name of Gould exhibited a closer approach to the ideal convertible top at the San Francisco Automobile Show in 1919. It was meant to fulfill the California demand for a top with permanent roof and glass windows which could be quickly stowed or removed. 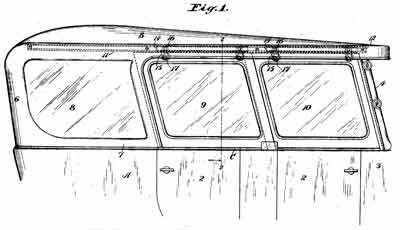 In this design, the windows slid back into a pocket formed in the rear-quarter window, and were concealed in this way when out of use. 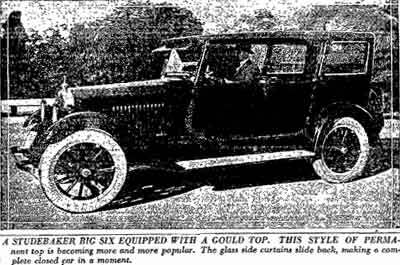 "This top can be built on any touring car or phaeton body. A set of sills is first screwed securely to the body top rails and from this foundation side quarters are screwed on 'o a slatted roof construction built up over bows. This frame is covered with the usual artificial leather or top material and the inside is lined similar to a closed car roof. The window frames are covered in the same way and. where space permits, a hinged wind deflector or ventilator is built-in between the windshield and front door. "Mr. Steinbeck described informally the construction and operation of the top, and answered such questions as were put to him by individuals in the audience. "*By Paul W. Steinbeck, paper read before the S.A.E. 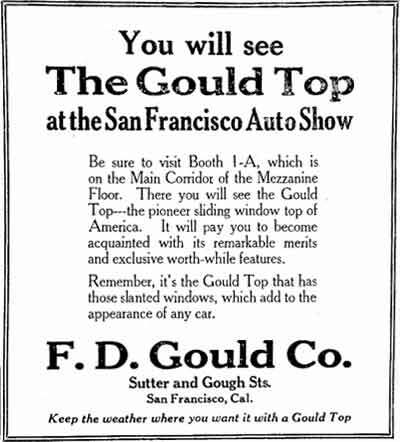 in New York, Jan. 11, 1922"
In addition to the San Francisco Auto Show, the firm also exhibited the patented Gould Auto Top at the 1922 California State Fair which was held at the State Fairgrounds in Sacramento from September 2 to September 10, 1922. 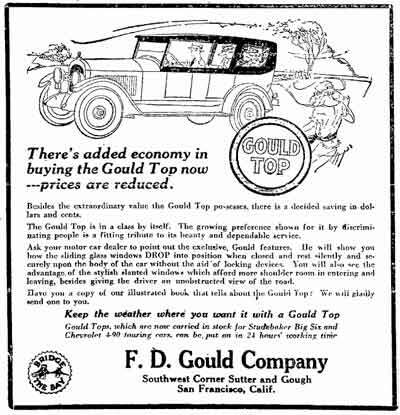 It's interesting to note that classified ads in the San Francisco newspapers for the Los Angeles-built Leach automobile, the first production car equipped from the factory with an all-weather California Top, mentioned their "Gould Top" as a selling point. 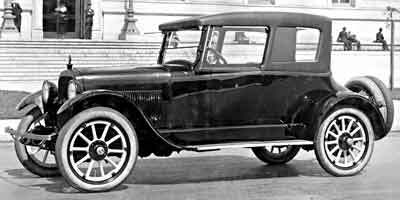 I could locate little or no information on the firm's activities past 1924 so it's likely they, like many other firms in the same line of business (including Leach), succumbed to the success of factory-built closed automobile bodies. Click here for more information on the Leach.